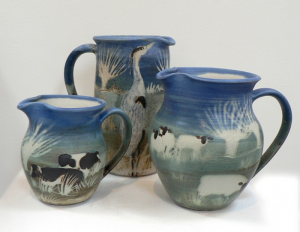 Somerset Countryware is a range of stoneware pottery made and decorated by Mary Kembery in her studio at Drayton, where she has lived since 1985. Apart from the Somerset landscape, she also draws inspiration from fish, fruit and flowers. Coloured slips and underglaze colours with a combination of decorating techniques, including waxing, stencilling and scraffitto, may be used on a single piece to achieve the desired effect. The work is fired to stoneware temperature around 1235c in an electric kiln.